This house is located in mid Beacon Hill somewhere east of Beacon Ave. Truthfully I was a little lost when I ran across it so I can't say exactly where. I was so excited about the AWESOME statues in the front of the house that I totally forgot to take photos of their well groomed shrubbery so you are just going to have to trust me that it was cool. 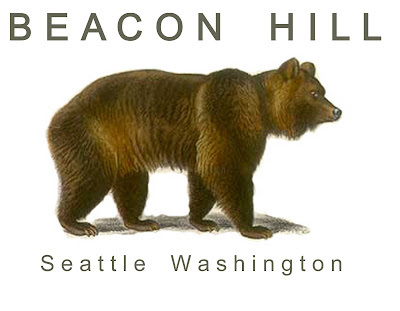 Here at Behi Bonsai we are celebrating the fact that there seems to be a bear running around Beacon Hill by opening an online store. Now you can order T Shirts that show your neighborhood pride and it can help you identify large furry land mammals at the same time! All proceeds will be donated to local charity so order a bunch today. 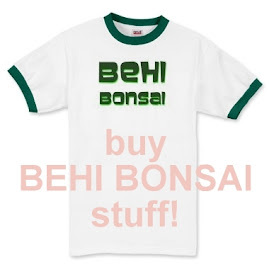 CLICK HERE TO GO TO OUR STORE! Why just stop when you have a nice well shaped bush? This person decided to add a second story to their shrubbery and deserve Bonsai of the Week for going that extra mile. Located somewhere over by the Viewpoint Park, it makes me think that Dr. Suess might have trimmed his bushes to look something like this. This is my favorite yard this week, it's along 15th Ave S in central Beacon Hill. Not only are there a lot of crazy Bonsai, but it's topped with plastic animals and even a palm tree! Beacon Hill at it's best! Someone just pointed me to the link to Behi Bonsai in the Seattlest. Thanks for the cred! I've been admiring people that form their shrubbery as walls that separate them from the street. If you think about it, who is going to put graffiti on a bush? Plus it can change over time, if you don't like your neighbor you could grow it bigger or maybe carve hearts into it for valentines day? It's still a labor of love but probably more eco-friendly than chopping down some trees to make a fence.